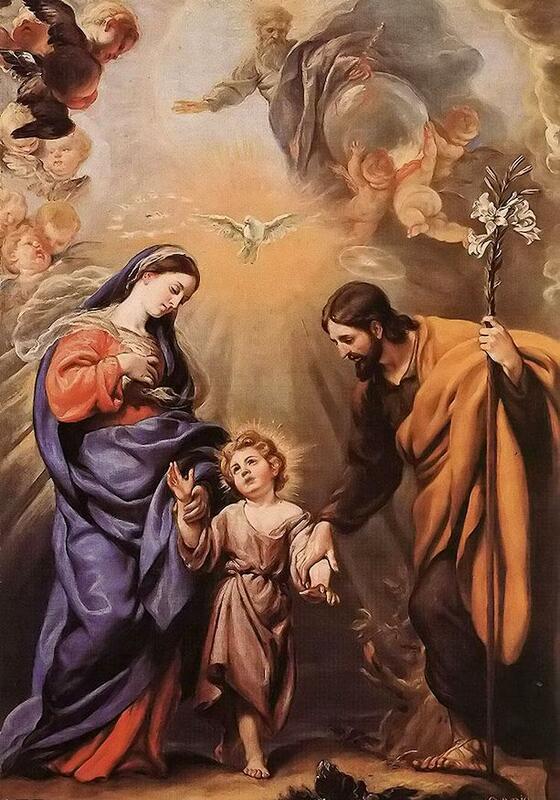 St. Joseph was chosen by the Eternal Father to be the spouse of the Blessed Virgin Mary and the Foster-father of our Lord Jesus Christ. As the faithful guardian of the two greatest treasures, he was a virtuous and chaste, a “just man” as the gospel of Matthew tells us. A carpenter by trade, he rendered his life completely to God and with sublime faith believing without hesitation the words of the angel. Tradition holds that the high priest in the temple, summoned all the unmarried man form the race of King David, among them Joseph, and divinely inspired, follows Moses’ prayer when Aaron’s priesthood was questioned; God replying to him: “Whomsoever of these I shall choose, his rod shall blossom”. (Numbers 17, 5) Joseph’s rod budded, blossomed and bore beautiful flowers while a white dove descended upon it. The white lilies are the symbol of his purity and the staff is the symbol of how he would protect the Holy Family and how he is protecting the Catholic Church with his patronage. Every FNE group choses different colors for the neckerchiefs. Brown and white are the colors we have chosen. The brown represents the wood of St. Joseph’s staff, his and our strength and human ability. White represents the purity of St. Joseph, the virtue that the Father bestowed on him making him worth to be the spouse of Mary and Christ’s earthly father, a virtue we pray and strive for in our journey as Explorers.